Revenge in The Count of Monte Cristo – The Bookshelf of Emily J.
I recently “read” The Count of Monte Cristo (1844) by Alexandre Dumas by listening to it on CD. It is number 65 on the BBC book list and some 117 chapters, so I knew the only way I would have time to get through it would be through listening to it on my long drives to school. The best thing about listening to it was that I learned how to pronounce all of the names in the novel. Clearly, the protagonist Edmond Dantès is a Christ or hero figure. I wrote in detail about the hero cycle in my Harry Potter post, but to review, a hero faces great danger (usually as a child), has a mentor, descends to the underworld to complete his journey, comes back (or is resurrected), and usually saves his people, among other things. Dantès fits this well. He faces great danger at age 19, on a ship in the ocean, and then comes home to the danger of reputation. He plans to marry Mercédès, but before he can, he is plotted against and sent to prison, the famously hard-to-escape-from Château d’If. There he loses hopes and wants to die, but he meets a mentor, an old man, the Abbé Faria, in another cell. They create a tunnel and begin visiting each other. The old “mad priest” teaches Dantès all he knows, encourages him, helps him to figure out the treachery of his friends that led to his imprisonment, and gives him a treasure map. He even helps him to escape, by dying. Dantès hides in the dead man’s shroud and is tossed into the ocean, very much alive. Faria is Dantès mentor. His time in the prison is his trip to the underworld. He escapes, finds the treasure, and then returns to his friends in disguise, as the Count of Monte Cristo. He also appears as Sinbad the Sailor and the Abbé Busoni. He does not reveal himself as Edmond but instead plays an elaborate game of cat and mouse by living among the people who forsook him and uncovering their secrets. He is there to get revenge. And that’s where the comparison of Dantès to a Christ figure bothered me. Dantès was a kind, good, innocent man, one who was trusted by his father, employer, and fiancée. He was noble and good and true. Then he emerged from prison and took his sweet time exacting revenge on everybody, including Mercédès, who ended up marrying his rival, Fernand, one of the men who sent him to prison. He comes out hard and mean and scheming and conniving. I had a hard time believing that Dantès was still righteous and god-fearing and that his actions were Christ-like. In the end, he does offer forgiveness to the men involved in his demise, after torturing them physically or emotionally and ruining them financially. He exacts revenge, even to the point of being willing to kill Mercédès son, but in the end he is softened by her pleas. Ultimately, her son proves to be good and kind, sparing the Count of Monte Cristo’s life. The end also leaves Mercédès alone and destitute, while Dante’s goes off and marries Haydée, a slave he purchased and then freed and restored to her rightful position as a princess. She is much younger than he, but that is how he gets his recompense for the years lost, I guess. The last line of the novel says “wait and hope,” meaning that sometimes it is all we can do in life. That’s true, and Dantès embodies this while in jail, but afterwards he becomes “righteously” angry. He is also good at waiting to exact revenge, but I don’t see much hope in him. Overall, it was a slow and dense book, and maybe a little boring in parts. I can see that it was a product of its time, however, so I can’t fault it for some of the wordiness and over explanation. There is some great commentary on the rich and their faults. Danglars, while being extorted by the Count for his last five million, is truly despicable. He is held without food and then told he can buy the food for exorbitant amounts or just give up his money and be free. He would rather be in prison than give up his money, although it has been his at the expense of a hospital. He’s truly greedy, and he reminded me of a documentary I watched called Park Avenue, about the extremely wealthy in the United States and their unwillingness to give up tax loopholes that favor them. It also explored the extreme influence the rich have on the government. The documentary obviously leaned left, but it raised many important issues and I enjoyed it. In addition, it was nice to have my husband, a CPA, watch it with me to explain some of the tax law and why things are the way they are, but I finished it with a bad taste in my mouth for the wealthiest in our country and for the privileged 400 people who control most of the money. Danglars reminded me of the attitude of many of these billionaires, for he could not let go of his money. Without it, he felt he was nothing. It became his identity. Similarly, the Count is rich beyond measure and uses it to punish the wealthy for their personal mistakes and trespasses against him. I instead wished he would have come back and revealed himself, righted some of the wrongs of the past, and then gone away and lived happily for the rest of his life, instead of having to make everyone suffer in humiliation. The book really is an examination in how to overcome the wrongs somebody has done you, and how to act when you’ve got the upper hand. Should you exact revenge or forgive? What would you do? I absolutely agree with you! While revenge seems sweet before it’s enacted, it always leaves you with a bitter taste in your mouth. Forgiveness leaves you feeling…resolved. Thanks! Resolved is a good way to describe it. It reminds me of James 5:1 in the bible which says “Now listen, you rich people, weep and wail because of the misery that is coming on you.”. But it is certainly not Christ-like to inflict that misery. I agree. That was certainly the biggest problem, for me, of the book. Edmond did not live up to his obviously mythic qualities. Love this book and have read it twice. It is a fine piece of writing and definitely deserves to be on everyone’s top 20 or whatever list one has to keep track of masterpieces! This book is one of my favourite novels! I love it and I’ve read three times and I saw the film. No doubt is a masterpiece. Three times? Wow! I saw the film years ago, but now I want to watch it again. I need to put this on my reading list. I’ve been hearing about it since I was a kid, but never got around to reading it. So true. It is one of those books we all hear about but maybe not all of us read it or get the chance to. Glad to read you got through it in the end! I can’t wait to read your post. I’ve seen a lot of articles floating around about this. Studies are showing that if you give somebody more money than another (in an experimental way, like when playing Monopoly), they tend to act with more callousness and to believe that they somehow deserved it more than the other person. Interesting stuff! I’ve never read this one but hadn’t heard the Christ comparison — interesting — but does seem very off, although do they mean Christ-like in terms of ‘resurrection’ (his rebirth as the Count) rather than his behavior? I’m only guessing here, having not read the book nor the article(s) suggesting this. Very curious…! It is more of a literary device or pattern, more commonly known as the hero cycle. So nobody specifically said, “This character is a Christ figure,” but it is implied in the pattern of the story. So the character follows a heroic pattern, rather than necessarily having the exact same attributes as Christ. But I was bugged that the pattern was followed, but that Edmond didn’t seem to be a good example of it. Anyway, I hope that makes more sense. It was more me complaining that he follows the pattern but doesn’t live up to it, in my mind. This is actually one of my favorite books – I’ve read it at least twice. To me, the ending shows the Count regretting the ruthlessness of his own revenge, of leaving Mercedes destitute, ruining Villefort, and so on. This is why Danglar gets off easier than the other men who instigated the Count’s prison sentence. Ah, I can see that. That helps to see some redemption for the count at the end and a glimmer of hope that all of this vengeance is finally over! I just watch the movie, its great! but a bit far from its roots. Great review! Thank you, Angelica. I am planning to rewatch the movie soon, and yes, far from its roots for sure! Oscar Wilde once said: The greatest cruelty we can unto others is not to hate them but to ignore them. That’s my form of revenge. And once enough time has passed the ignorance turns into a form of (quiet) forgiveness. Oscar Wilde is usually right about everything! That quote is so true. I had a friend once start ignoring me, after yelling at me, and honestly the ignoring was more hurtful. It was her saying that I didn’t exist. I’ve also had my mother pull the same tactics with me. It isn’t pretty. I have an older and wiser friend who once told me that the best revenge is to live well. It is a cliche, but it gets me through sometimes. Fantastic post. Absolutely love the story, and the movie is one of my all-time favourites. Forgiveness is, quite often, the more noble, rewarding road to take. However… when you have your love, your life, and your sanity taken from you, forgiveness would probably feel a bit hollow. He was in Chateau d’If for like twelve years! You think he’s going to get out and then just forgive and forget? Honestly, who would do that? Wilde’s quote, “The greatest cruelty we can unto others is not to hate them but to ignore them,” pertains to everyday occurrences. Bullies and such. But for some people — who steal your wife, your career, and your good name — ignoring them just gives them everything they wanted. It allows them to get away with HORRIBLE things. Should Edmond have forgone justice just so he could feel morally superior? Ooh, excellent points! I certainly wouldn’t have forgiven easily. I guess my problem with him not forgiving isn’t that he doesn’t; it has more to do with the narrative’s claims that he is such a great guy, even Christlike. So his actions don’t match up with that. But perhaps that teaches another important lesson: that nobody is perfect? Or that one must go through the process of being angry and acting out before one can come to forgive? I’m not sure. I guess there are many different ways to read this text and gain insight from it. I kind of like your take though. Yeah, I wouldn’t forgive somebody who stole all of that from me either! No way. Absolutely! Perhaps this narrative is more satisfying than other hero stories because he turns out to be just like us. But he does offer some forgiveness in the end. There is a glimmer of hope there. 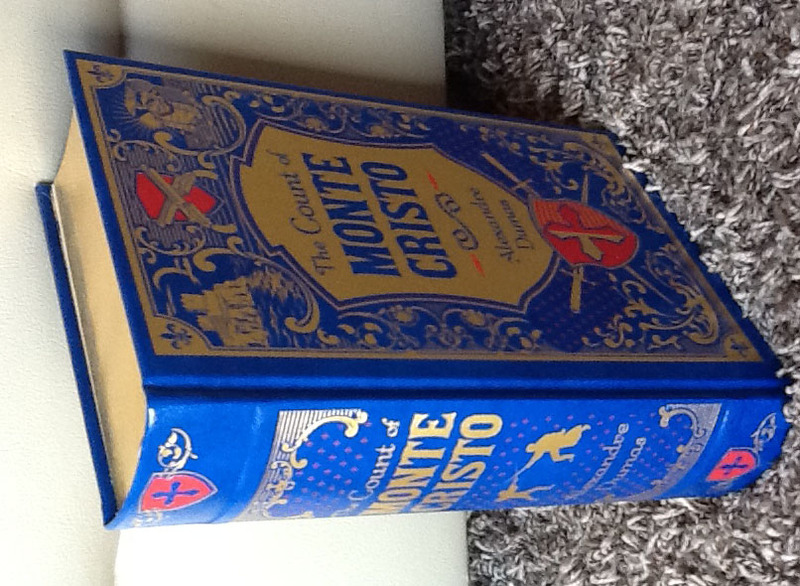 I read The Count of Monte Cristo earlier this year, and I enjoyed the perspective that you brought to it. I didn’t notice it as much before, but you’re right; Dantès was overly religious about exacting revenge for past wrongs. However, I didn’t think the book was slow, but that might have been because I read it right after I had finished reading Les Mis! Great review though, thanks! Thanks! Yeah, I think my perception of “slow” changes depending on my moods when I read. Yes, he was way too vengeful to be the type of religious figure that I am used to. Perhaps he represents that more “jealous” and vengeful God we can read about in parts of The Bible. Thanks for commenting! I have watched the movie, I have never read the book. Now that I know how the book ends, I prefer the movie. I have also read Les Miserables, and watched the movie. Something I noticed that both movies have in common is that many of the characters that are respectable in the eyes of society, are really evil or depraved, or both, while the ones that seem despicable, end up being the heroes. One example is Eponine; she is evil and despicable all through the movie, but she ends up taking a bullet for Marius. Do you think that is Dumas’ way of saying that everyone has the potential for great good, and great evil? Yes, absolutely! What an insightful observation. I actually just watched the movie a few days ago. It is completely different from the book! I think the plot of the book is much too complicated (and a little tiresome and boring) to translate well into an action movie, so I see why they did it. They changed Mercedes son to be the count’s son and had them end up together. I did prefer that! I loved The Count of Monte Cristo; I saw the version with Gerard Depardieu in it. I took French, online, as an elective in college, and someone mentioned the movie in a class forum discussion, so I thought it would be great to watch the movie, in French, with subtitles, and then discuss it with others in the class, but when I did, no-one was interested. Which is a shame, because it was a great movie. Ooh, I want to see that version. I bet it is more true to the book than the American version I saw. I waited to comment because I was in the midst of the book when you posted this. I loved this book! Though it made me very uncomfortable in parts. It was awful what happened to Dantes, but the deeper into the revenge part the more I was uncomfortable with his technically justified vengeance. What bothered me is that he was punishing innocent people, the families of the guilty parties. And with each attack he learns a partial lesson. Mercedes intervenes and he discovers that Albert should not carry his father’s shame; he is horrified at the innocent boy who was killed by Villfort’s creepy wife and finally, as he says to Danglars at the end of the book, that he forgives him because he needs to be forgiven. I think there is growth of character by the end of the book but it is a process, which I find so realistic, in a completely unrealistic tale. It read like a soap opera to me. I found it very creepy that he was so insidious: he was omnipresent and practically omniscient, he controlled every aspect of his encounters with people. Even the two people he actually seems to have genuine feelings for are used for his own purposes, Morrel and Haydee (who is another creepy aspect of the book). I think the real tragedy of the book is that when he breaks free he has all of this wealth and Haydee where he could be happy. But instead he ruins his own next ten years or so breathing this hate and keeping it alive, until he is almost empty. He is completely blown away by the idea that Morrel and Hadyee both love him. I found this book to be a unique mixture of fluff and profundity. It really calls into question the ideas of justice, forgiveness and revenge. It is a strange thing. We put people on death row who murdered someone unjustifiably, but as time passes we begin to feel compassion for the murders. Stephen King’s “The Green Mile” is an excellent example of this. In this book I found myself feeling compassion for Villfort, the most, he was only protecting himself when he falsely had Dantes locked up. The other three were just jealous. Your thoughts match up pretty closely with mine. I hope he had an editor say that, but if he’d had a good one, it probably would have been a lot shorter! 🙂 Yes, creepy and profound and full of fluff and sad and twisted and unbelievable. All of that. I actually just watched the Jim Caviezel version of the film. I kind of like what they did with the plot, but it was a little cheesy too. I’m glad you read it and weighed in.